Visitare Bologna e soggiornare presso l'Hotel Tuscolano. Are you looking for a hotel in Bologna that is quiet, simple, comfortable and functional? Hotel Tuscolano is the ideal hotel for your stay. Visit Bologna, with its ocher-colored arcades, its underground waterways, its towers, medieval and Renaissance buildings, its red roofs. 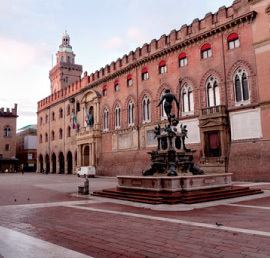 Bologna is famous for its culture, it offers delicious “fatty” food, and has the most ancient university of the world. Bologna is a city of great songwriters, artists, and is recognized by the UNESCO for its 40 km long arcades. In Bologna you will find old taverns with traditional food, characteristic small shops called “botteghe” where you can buy homemade pasta and tasty mortadella. It is worth to visit Bologna’s lively pubs local people and students, where you can hear good music e.g. jazz and live music, take a motorbike “Vespa” and go around the harmonious hills surrounding Bologna and visit the Sanctuary of San Luca that offers a beautiful panorama of the whole city. Are you looking for a hotel near the Bologna Trade Fair Center and Congress Palace? 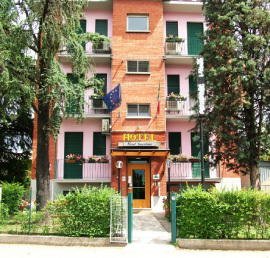 Hotel Tuscolano is the ideal hotel for your stay, as it is distant only 10 minutes from Bologna Trade Fair Center. When staying at Hotel Tuscolano, we offer you attractive rates, in some periods great deals, also during the fair event periods that are held throughout the year in Bologna: Artefiera Forum Pool, Fishing Show, Children's Book Fair, Cosmoprof, Lineapelle Autopromotec , Zoomark, Cosmopharma, EXPOSANITA ', Sana, Cersaie Saie, EIMA, World creative Motorshow. Are you looking for a convenient hotel in Bologna with all the amenities? Hotel Tuscolano is the ideal hotel for your stay. Whether you come by car, train or motorcycle, - Mirko, Graziella, Stefania from Hotel Tuscolano will welcome you into a friendly and cozy environment which will make your stay a pleasant experience.